Spring Boot example with Flyway for DB migration. DB migration can be done using flyway db under the hood by providing some configuration details and migration script. When you execute Spring boot application. It will search for migration script in location defined in application.yml(locations: classpath:migration). If it finds any, it will execute all script which are not yet executed. To identify scripts status flyway uses table “SCHEMA_VERSION” in current schema. If it is not there and schema is blank, flyway will create one. 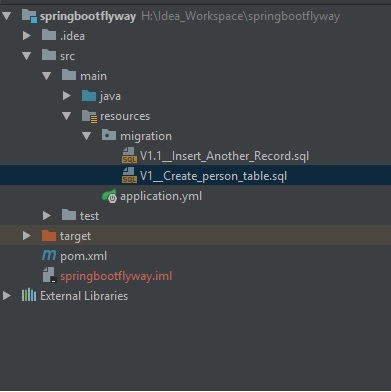 If you run Spring boot Application without schema or blank schema, flyway will execute migration script and you will get to see below details in console. o.f.core.internal.command.DbMigrate      : Successfully applied 2 migrations to schema `jbt_db` (execution time 00:00.600s). If you check mysql DB. You will find new schema(jbt_db) and new tables (person & schema_version). SCHEMA_VERSION table will contain details of all the migration done till now. where can I add the second schema?